International Vendors Week, which occurs in the beginning of February each year, is the celebration of street paper vendors. Groundcover News, Ann Arbor's local street vendor newspaper, participates each year to show support for their vendors. In 2017, Michigan Is My Home delivered their first MPower packages to vendors and individuals during International Vendors Week. Continuing with their partnership with Groundcover News, MIMH members volunteered once again on Sunday, February 11 to deliver care packages to vendors selling newspapers. 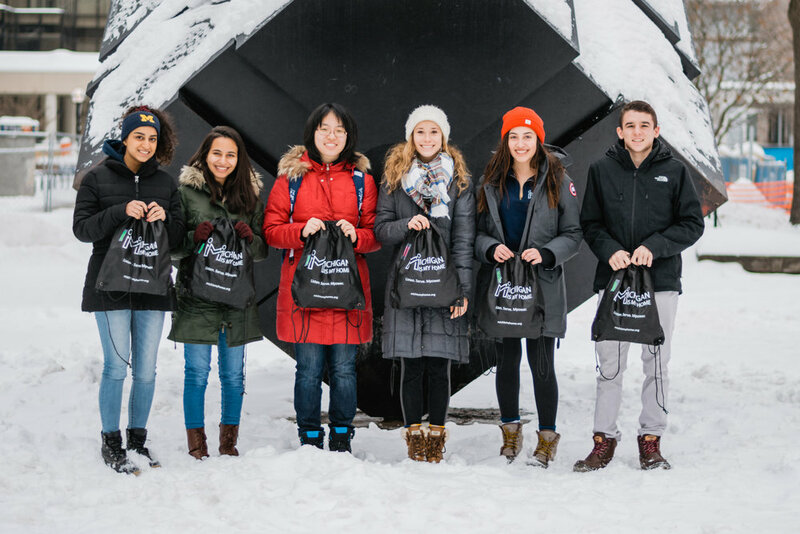 These MPower packages included hats, scarves, and hand warmers to reflect the chilling temperatures in Ann Arbor this year. Michigan Is My Home hopes to continue to show their support for Groundcover News and their vendors. Michigan Is My Home members holding MPower packages to be distributed to street vendors.